Heat closed contact grill 5 minutes. Meanwhile, in large nonmetal dish or resealable food-storage plastic bag, mix steak, onion, bell pepper and fajita seasoning; stir or turn bag to coat. When grill is heated, place steak and vegetables on bottom grill surface, spreading evenly; close grill. Cook 4 to 6 minutes or until steak is desired doneness and vegetables are crisp-tender. Place steak and vegetables on plate; drizzle with lime juice. Spoon steak and vegetables down center of each tortilla. Top each with sour cream and salsa. Bring sides of each tortilla up over filling; press to seal. Clean grill by carefully wiping with damp paper towel. Place 2 filled tortillas on hot grill; close grill. Cook about 1 minute or until tortillas are heated. Repeat with remaining filled tortillas. Use several moist paper towels to clean the contact grill easy. Keep the portion you grasp dry so the heat doesn't transfer to your fingers. Unplug the grill when cleaning, then immediately plug in again to continue grilling. Two of the most popular ways to prepare fajita filling are cooking in a frying pan on the stove, or cooking on a grill like in this dish. This recipe for grilled steak fajitas has all of the classic ingredients found in traditional Tex-Mex fajitas: strips of steak, onion, bell peppers and toppings like salsa and sour cream. This dish yields two servings (two fajitas per person) so it’s great for small households, but the recipe can easily be doubled to accommodate larger families. 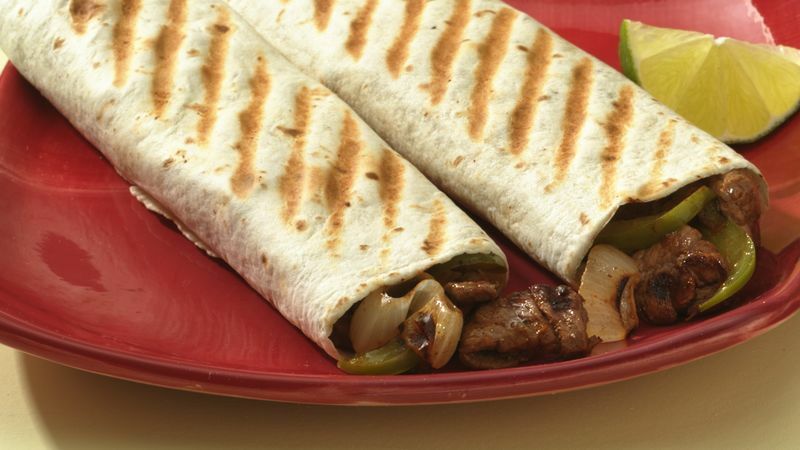 Why stop at just fajita? We have a whole digital library packed full of more popular Tex-Mex and Mexican recipes like tacos, burritos, quesadillas and more.